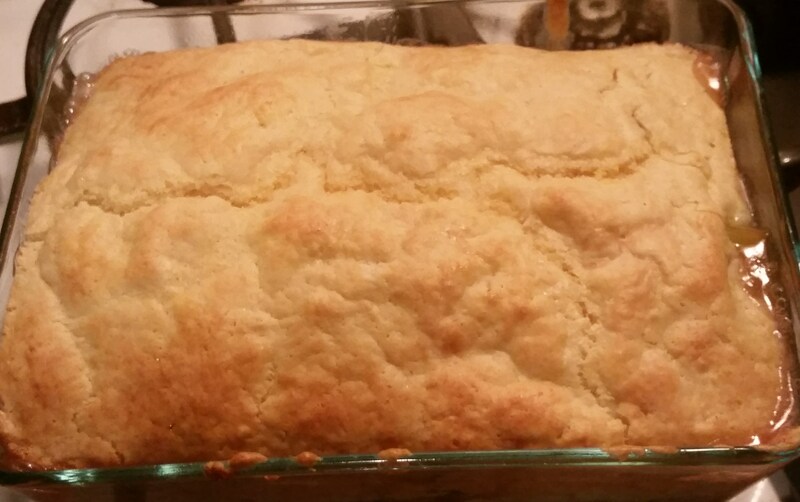 This recipe is a variant on the same basic one I posted about for peach cobbler last summer, it is modified from a muffin dry mix in Bette Hagman’s book, More from the Gluten-Free Gourmet and uses a flour mix that will give you 4 cups of the dry ingredients. One cup will make an 8×8 pan of cobbler topping. 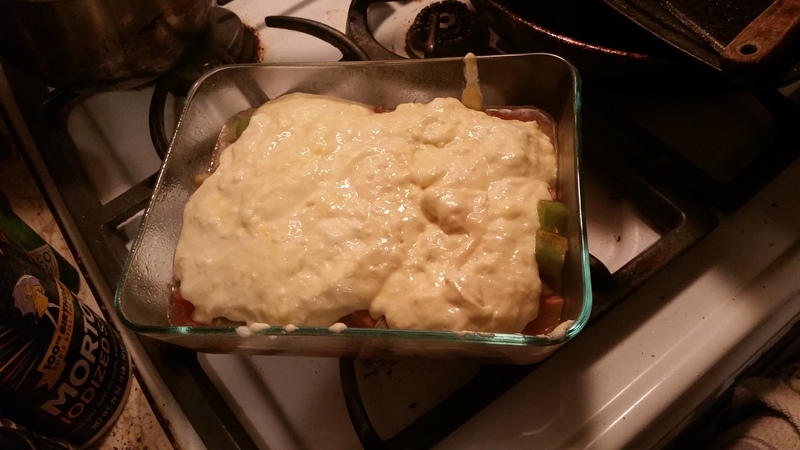 I used a rectangular pan but it is just slightly smaller than 8×8 and worked perfectly. I store the rest of my dry mix in the freezer so a pan of cobbler can be thrown together in less than 10 minutes plus baking time. I always get the fruit part cooking before putting the topping together so the fruit is hot and ready for the topping and can go right into the oven. Ripe sweet fresh fruit is vital for a successful cobbler. No canned or underripe fruit will do. Recently I made this for my guy who used to be quite skeptical about rhubarb until he recently enjoyed my rhubarb crumb pie and then tried some of this cobbler last weekend. He loved it and asked for a serving of it to take for lunch the next day. Convert… You can be the next to change your mind on rhubarb for dessert! Blend well and store leftover dry mix in a freezer bag or a jar in the freezer. Mix the fruit and almond extract in a sauce pan. Stir together the sugar, cinnamon and flour and mix into the fruit. Cook on the stove top for 5-10 minutes until it is thickened and hot. Pour into a buttered 8 inch square pan, top with big blops of the cobbler topping. Let cool 5 minutes before serving as it will burn your mouth right out of the oven! Oh the torture to have to wait. Some people love it with a scoop of vanilla ice cream. 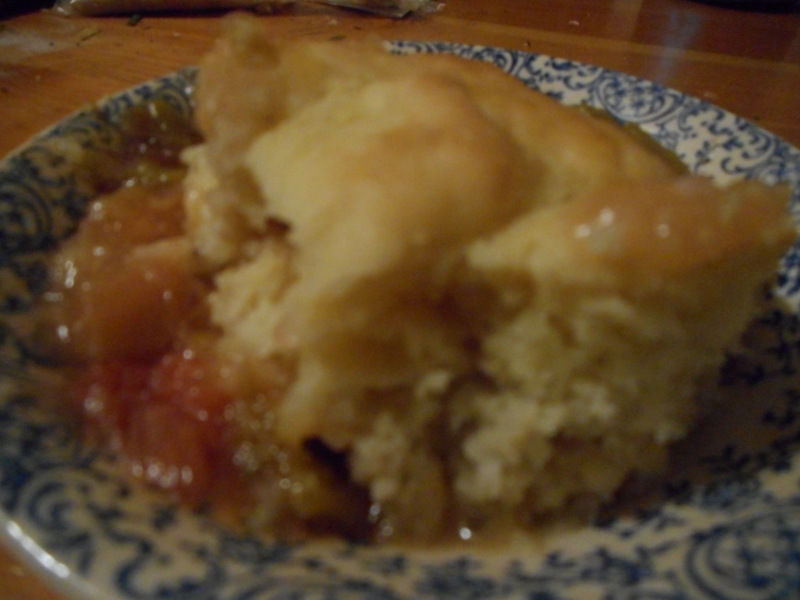 But I think this tender and sweet rhubarb cobbler is perfect just on its own.